Back to school again today. I feel like Sunday nights always sneak up and slap me in the face around 9pm when I realize all that I have to do for the following morning. I wasn’t taking requests today so Miss G gets some square packages that I turned into a lunch “present”. Her sandwiches are Justin’s Almond butter and strawberry whole fruit spread on Ezekiel Low Sodium bread. I made my ribbon out of soy cheese and put a bow pick in the top to keep the two squares together. At the top left is a pile of fresh blueberies from King Family Farm and Market that we visit weekly with a bunny pick and bunny baran (food separator) in the back for decoration. 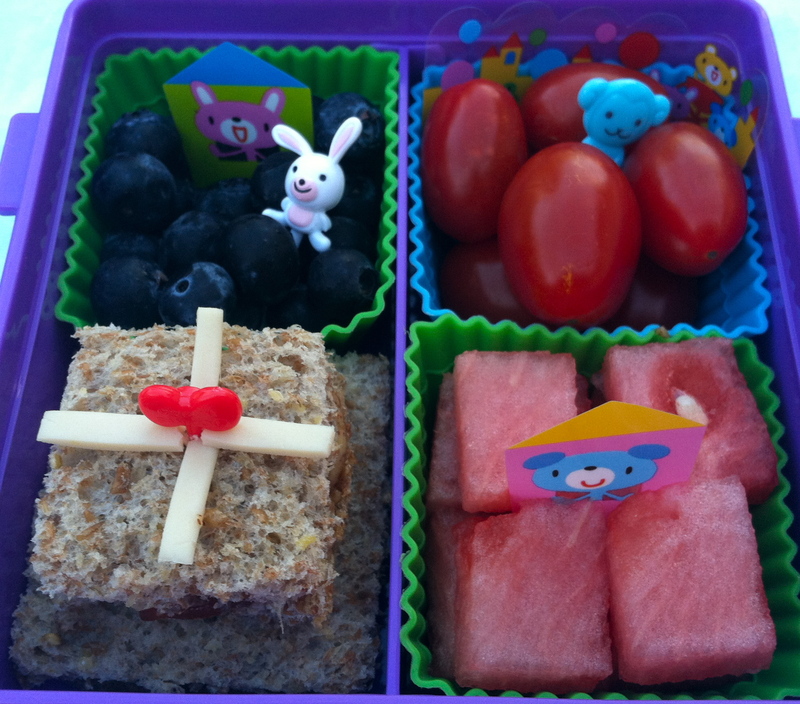 At the top right are grape tomatoes and a blue monkey pick, and at the bottom right are watermelon squares packed in her Hello Kitty Sanrio bento box. Miss A has the same sandwich on Ezekiel bread with Justin’s almond butter & fruit spread. She has a pair of soy cheese shades and a fruit leather smile on her “cool” face today. To the left of the face is a small square of dried cherries and apricots. 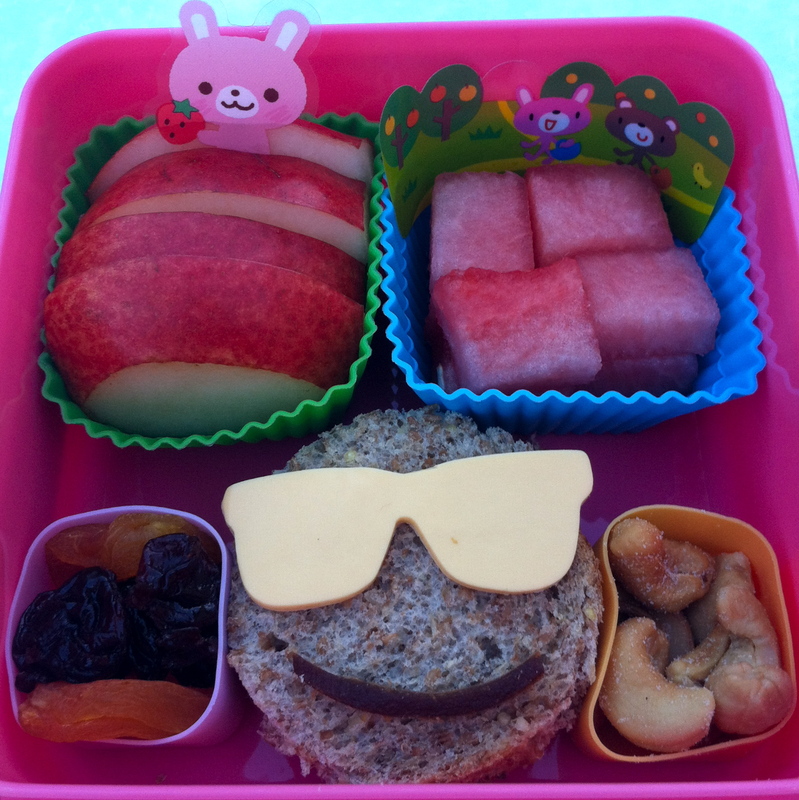 At the top left are sliced pears with a pink bunny baran, the top right are watermelon squares and the bottom right is a small container of cashews packed in her pink Hello Kitty Sanrio bento box. Both girls have ice water in their CamelBak kids bottles. My husband is having black beans and rice with veggies not pictured here. To go along with his main lunch, I packed him a salad of mixed baby greens. On top are sliced baby cucumbers, red grape tomatoes and a mini sweet red pepper cut in half, seeded & shaped into hearts. 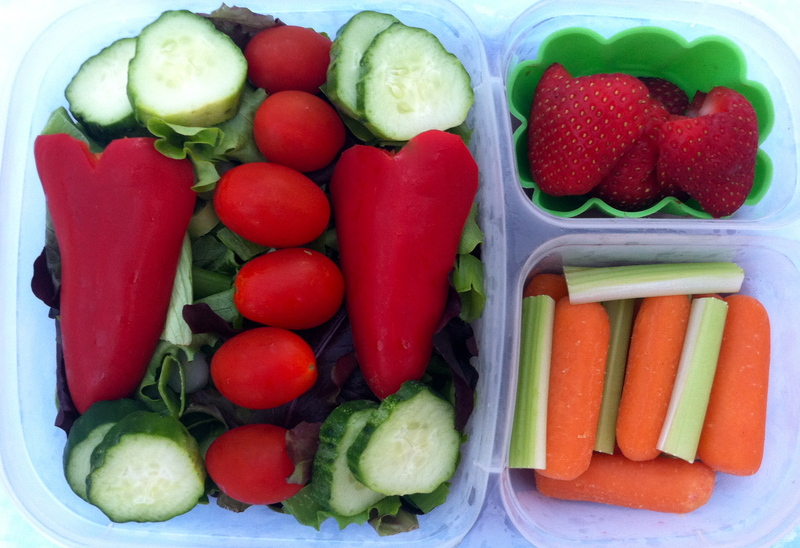 At the top right are heart shaped strawberries and at the bottom right are carrot & celery sticks packed in his Easy Lunch Box. 2 Responses to "Squares and shades"